It took a number of years after Oscar Wilde's death before he could truly rest in peace. Even now, a century after his departure from this realm, there is a constant stream of tourists milling about over his head. Wilde, who was born in Dublin , Ireland , is best known as the author of The Importance of Being Earnest and The Picture of Dorian Gray. Wilde is just as well known for his own escapades as his literary works. Certain aspects of his not so private life resulted in a imprisonment for "homosexual acts." Physically broken by the harsh jail conditions, he died in 1900, three years after his release. He was interred in an unremarkable grave in Bagneaux Cemetery in Paris and resided quietly there for nine years. At a dinner at the Ritz Hotel in London, in 1908 the executor of Wilde's estate revealed that he had received an anonymous gift of £2000 from "a lady" to place a suitable monument at Père Lachaise and that this work should be carried out by the brilliant young sculptor, Mr. Jacob Epstein. Years later it was revealed that "a lady" was Helen Kennard Carew. On July 18th, 1909, the night before the transfer of Wilde's remains to Père Lachaise, the sextons at Bagneaux Cemetery dug up Wilde's grave and Placed two ropes beneath the coffin. Since it was raining they placed a couple of tombstones on top of the freshly dug soil to keep it from falling back into the grave. The next day a number of journalists and other on lookers gathered at the grave to witness the exhumation. At some point one of the tombstones holding the soil in place slipped off its perch, fell into the open grave and crashed onto Wilde's coffin splitting it open. For a brief moment, Oscar's face was exposed to the heavens. Then torrents of mud came rushing in. Wilde's mud encrusted remains were transferred to another coffin and moved to Père Lachaise, but his post mortem saga was just beginning. After receiving his commission, Jacob Epstein decided to base the monument for Wilde on Wilde's poem "The Sphinx." Epstein chipped away at it for overthree years. 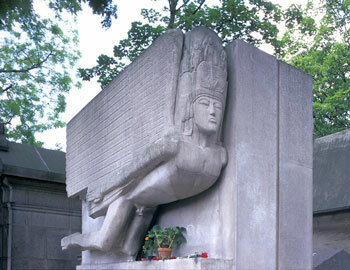 Finally, the monument was moved to Père Lachaise and installed over the grave of Wilde. But when Epstein arrived at the cemetery to apply some final touches, he found his creation wrapped in a shroud. The cemetery conservator had determined that the depiction of the genitalia on the statue was indecent and refused to have the statue revealed for public display. Despite public protests the conservator would not yield. Eventually a compromise was reached and a fig leaf/plaque was placed over the offending parts. In 1914 the Egyptian style monument was finally unveiled. Alas, the offenses to poor Oscar were not quite over. One night in 1922, a group of students entered the cemetery determined to set things right and free him from his fig leaf. Unfortunately, when they hacked away at the fig leaf a substantial part of the statues's offending parts were severed from the statue. Local legend says that for years the "parts" served as a paperweight in the cemetery superintendent's office. But, such is the stuff of legends. Rest in peace, Oscar.